New to #GamerGate? Check this out. Before I get started, I wanted to add something up top. The #GamerGate community has been, by a large margin, the best online community I've ever been a part of. These are some of the nicest, funniest, bravest people I've ever known. The community is also the most diverse group of people I've ever spoken to. There are many men, woman, people of every shade and hue, orientation and location around the world. I wanted to make a post for anyone who might either be new to #GamerGate or who has heard (probably incorrect) things about it in the media. Here are a few videos that should catch you up. Not much time? Check this out. #GamerGate in 60 seconds. This is a very good, very quick summary of the #GamerGate movement/revolt. If you see nothing else, watch this. HuffPost Live: 3 Strong Women Of #GamerGate Fight Back! Three awesome ladies (two of which support #GamerGate, one who's neutral) go on the Huffington Post Live stream to try and set the record straight. From the always awesome Christina Hoff Sommors, a prominent feminist, a look at what the media has gotten wrong about #GamerGate. I was going to compile some interesting reading here, but I think the GamerGate wiki page does a much better job. So go check that out if you want to learn more. Have any questions or concerns? 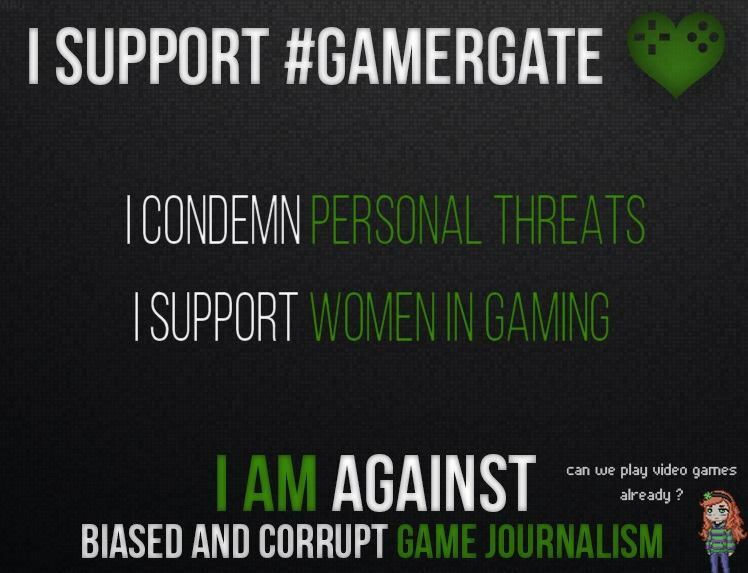 Head over to Twitter and use the #GamerGate hashtag and ask. There are plenty of people who would love to help you out by answering any questions that you might have. Karen Straughan: My talk at KSUM's Male Students in Peril conference. Win an Amiibo of your choice. Just a small post here, there's a contest running to win an Amiibo of your choice. Check it out here.